6 pp. Roman, 289 pp. In this volume, linguists take on issues of co- and subordination in sentence structures. On the one hand these structures are defined by more or less predetermined rules in individual languages. Therefore, the rules may diverge from language to language. On the other hand, they are subject to general and ongoing processes of linguistic change. This may result in common concepts of co- and subordination patterns. It is also observed that in syntax some grammatical categories evolved earlier and others later. The conceptualization of innovated categories also differs in languages. Intra-linguistic, areal, as well as universal developments are ascertained. Aspects of a Sprachbund may also come in. It can be generally concluded that contact-induced language change is a prominent feature in several co- and subordination strategies. The study focuses principally on languages and language families in the wider West African Lake Chad region, but, in order to incorporate universal typological issues, contributions from the Turkic and Slavonic languages were included. Relational DA as a preposition, coordinator, and subordinator in Hausa – Polysemy or homophony? The description of complex sentences in African languages is far from being adequate and this situation is not caused by lack of data, but rather by the variety of analyses that are hardly compared with each other in terms of linguistic interpretation. The book under review aims at examining the sentences expressing the relation of either co- or subordination and giving them a theoretical perspective. [...] The book [...] is a significant contribution to the studies on syntax in their documentary and theoretic dimension. With logically constructed sequence of articles, it deals with various aspects of co- and subordination, focusing on tendencies in the development of co- and subordination strategies. As far as the data are concerned, most contributions refer to syntactic devices of connecting clauses in African languages. The two articles dealing with European and Asian languages do not contradict any statement related to African languages. They rather manifest similarities in historical development of co- and subordinative strategies, but the African language data seem to be hardly adaptable to the generalizations made on European languages data. 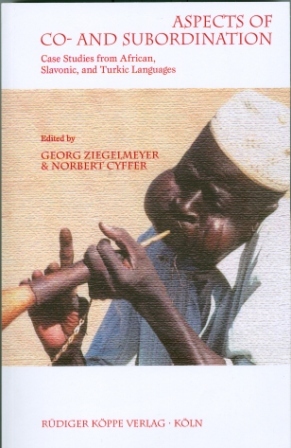 The contributions show that co- and subordination does not constitute a single research topic in African linguistics and the two variants of complex sentences are related not only to syntax but also to pragmatics, and discourse.